BOSS provides permanent multi-disciplined dedicated accountants and bookkeepers that work part-time or full-time (i.e. 1 to 5 days per week) or specialist casual staff for admin, audit prep or complete admin and audit work. Dedicated accountants and bookkeepers can use your procedures and work papers. All staff go through a one month induction program when they join on New Zealand issues, six months on-the-job training as well as continuous monthly tax training sessions. We train them on the software you use. We take care of all HR and recruitment. You are looked after by an Account Manager who oversees the initial integration process and can help assist you with anything you need. We provide all check lists and instructions to get you started and dedicated staff can use our work papers and procedures if you prefer. You can engage a part-time or full-time (i.e. 1 to 5 days per week) dedicated accountant that works exactly how your staff work. So that’s using your work papers and procedures, conversing over Skype just like you’d quickly chat to any colleague in your office, attending meetings, being coached on your methodologies (e.g. tax advisory work or looking for new value-add opportunities) etc, etc. As standard we provide an initial six month FREE review as part of our training and integration of new permanent staff to you. After the free review period the turnaround time for a dedicated accountant can be as fast as 2 days for an 8 hour job. We offer Virtual Administration staff for all admin duties you might require. We take care of all the HR and staff issues and on-costs, you just mange your work load with your Virtual Admin Assistant. If you run an accounting practice the Administrator can be briefed by BOSS on basic admin functions relating to accounting firms prior to them being assigned to you. You will have direct contact with the Administrator via Skype and email and be assigned an Account Manager who will attend monthly Client Service Meetings to ensure your expectations are being met. Virtual Administrators can be engaged on a dedicated basis (1 to 5 days per week) or pseudo-casual basis where you pay for a monthly block of hours and just add additional hours as you need them. 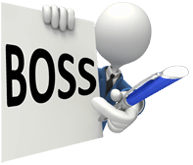 To know what the BOSS difference is click Why Choose BOSS or for more detailed information about other aspects of our service visit our FAQ.